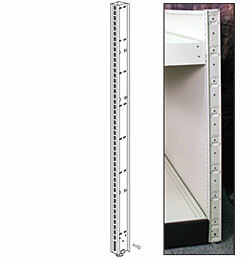 The basic upright is one of the major pillars to a Gondola Shelving unit that primarily holds up the shelving unit. 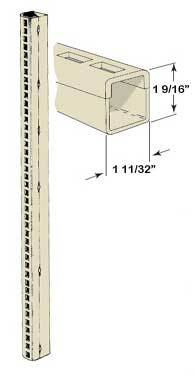 We have basic uprights available for Madix shelving. Half Uprights are wall mountable uprights that can be mounted to a wall in your existing wall studs that are 16" apart by most state, county, and city building code. You must use 4' wide shelves as when you mount the uprights into the wall they would mount in every 3rd stud that would equal 4' or 48". NOTE when using wall mountable Uprights carefully consider the load you need to place on the shelves connected to the Wall Shelving Uprights. Upright extensions provide the capability to add to the height of your existing Gondola or wall section. The extension backs are also available and sold separately. A splicer spanner is also required to connect the existing back panel to the extension back panel. We have upright extensions available for Madix shelving. The main component to a Lozier gondola unit that supports all the rest of the parts that make up a gondola section or unit. Lozier Uprights are available in all supported heights and colors manufactured by Lozier.